What gardener doesn’t love the seed-starting season? THIS ONE. Dang, it’s true. Perhaps I need to shell out a few hundred bucks for some hours of deep on-the-couch analysis, but…I hate the tyranny that is indoor seed-starting. I think I always have, consciously or not. Unlike other garden-related tasks that are both necessary and at least as messy, the whole lights/dirt/action dealio really is not my bag. With each year, with each modification I make to the process (mostly to ease my annoyance, not necessarily the betterment of the seeds), the less I really like it. So, I ask myself what I can do to get around this dislike. I have NO problem with starting seeds out of doors, and I even look forward to starting seeds in the greenhouse. Problem is, quite a few plants like both more light than is provided by the greenhouse at this time of year, and most seedlings dislike the temperature swings the greenhouse still goes through daily. But I do ask myself: what’s the flipping hurry? Why chain myself to the expense, mess and agitta of fluorescent lights? Because I LIKE the allium family, the solanaceae family. 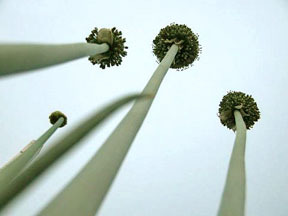 Alliums, in the form of storage onions, have this unmovable growth pattern that is tied to the sun: they bulb up the best when there’s the most daylight, so every day is a march toward that date, and the earlier you get marching, the bigger and better the plants will be. Tomatoes, peppers, eggplants, tomatillos, and okra like a nice, warm seedbed befitting their near-tropical ancestry. It is quite true that I could start these heat-lovers in the greenhouses themselves in late April, and just expect a later harvest. But storage onions and leeks, no, these babies require those lights. I just need to get over it, don’t I? I am with you sister! Outside I have drip irrigation systems on timers. I have to weed, sure, but the seeds are going to germinate without any serious hands-on work. Inside, however. One missed day on those seedling trays can mean everything dries out and then craps out. Sigh. Don’t get me started on the [imperfect] systems I use to raise and lower those fluorescents. Have you ever wiped out a full tray with an errant light bar? I have, and they heard the obscenity-laced tirade miles away. Gardening is supposed to be relaxing right? Well, El, I happen to love starting seeds indoors. Still, I can relate to the tyranny you mention and the rigors of hand watering, raising/lowering lights, etc. On the weekends that I travel with my choir, I regret to have to subject my husband to said tyranny too, not to mention worrying that he has overwatered or underwatered. Still, like you say, there are those allium…and the solanaceae. And my season is so short, if I didn’t get started in doors, the bets would be off. So, I grin and bear it. If all else fails, I am counting on being able to order bunches of onion plants, but I would rather save that expense. I do not have grow lights. I’m going to get serious about seed-starting this year. Friday I’m going to get a shop light with pink-tinted fluorescent bulbs and start my onions. I’m with you on that one, El. I don’t know just yet what else I’ll be starting, but certainly tomato plants. Last year I started 18 tomato plants but found that we didn’t really have enough light thru our windows for it, though we did succeed. But only by moving the started tomato plants from one window to the other and back again, day after day. And yeah I sure had to be careful about the watering and fertilizing. Fluorescent lights sound a lot better to me this year. Mary, I just laughed aloud when I read your comment. I loved it! Mary, I, too, have destroyed dozens of promising young seedlings, and spilled soil across the carpet. I thought I was alone! Ahhh well, you know I feel the same way. I hate starting seeds indoors, and I’m dragging my feet. It’s been on my priority must do list for the past week, and I’m still procrastinating. Today was the day I was definitely going to get to it. I do like the cart method I used last year (duh, once I figured out to anchor the dern thing), but that would require us to actually have some sunshine, which has been mighty scarce in these parts. Have you tried overwintering tomatoes and peppr? I haven’t but have heard it works. They still need light, of course. But less messing around with seeds. I love seed and starting them. I’ve got some of my lights set up and am ready to start some seeds this weekend. I have overwintered a pepper for several years now. It’s our ‘pet’ jalapeno that lives in a huge pot, on the patio spring, summer and fall and inside by a west window in the winter. It has tiny flower buds on it at the moment and we picked it’s final pepper a few weeks ago to add to chili. I’ve never tried tomatoes inside- I don’t have that much room. The hard part I am finding (admittedly in the first year) is all the planning and equipment – it seems that there is so much to coordinate and figure out just the right needs for each. I’m excited for tending the seeds and learning how to care for them, but the *doing* has me wishing I could just plant outside, and then not worry about transplanting, lights, etc. I’ve never heard of anyone speak of the tyranny of starting seeds, especially onions. The real heartbreak to me is when I plant an entire flat, give it good dirt, warmth, sunshine and water and what do I get? Sometimes plenty of warm barren dirt. At least your onions give you something to anticipate. I just received my first batch of seeds today. I thought this was going to be easy. All these posts, make me think I’m missing something….I’ll soon find out! well, yes get over it, El. I don’t really like it either, but I am generally more successful at starting seeds (not all but many) in cells or trays as opposed to direct seeding (slugs, cutworms and the likes…). I do like to start seeds! I started the usual suspects in the greenhouse… but promptly had to move them back in the house until they germinate and have a few leaves thanks to mice depredation. Also direct seeded arugula, spinach & frisee outside under Reemay. OMG Mary you had me howling, really, in commiseration!! I did the same thing last year or maybe the year before, taking out nearly a whole flat of nice, tall tomatoes with the light. (NOW I ask for Tom’s help when it comes time to lift them up.) You are definitely on to something, though: maybe I should just blame the lights themselves! AHA! Okay, Deborah: your beans really did look lovely under those pretty pretty lights. I will have to follow their progress. Beans have perfect (self-pollinating) flowers so your experiment should be a fun one to watch! Ed, I have printed and filled out the sweet potato company’s order form, and it is sitting right here next to me: those onions look so tempting!! Yeah you don’t necessarily need to start onions under light; with that particular family it’s the heat that initially gets them going. Once they sprout, light is nice, the more the better or they’ll spend too much energy trying to grow longer. Dennis, I have had equal success with regular old fluorescent lights, one cold, one warm in the shop light as the spendy “grow” lights so yeah, look into that. Sounds like last year’s method was fairly successful for you, but yeah, gotta follow that light, don’t you? Little babies need so much care! Anita, you are SO not alone! Heck, Mark, I never promise my seeds that: I tell them to hurry up and grow so I can eat THEM! But yeah, it’s something of a pain. Someone I know who has a heated greenhouse has offered to care for anyone’s flats of seeds at $14.50 a flat (he does all the watering, etc.) What a business. Danielle, yeah, you have an even bigger urgency to grow them than I: your season approaches sooner, and you’ve got CSA clients!!! I think the only thing that helps me stay sane in this season is that I do only a little tiny bit per day, biting off the task into manageable pieces. (I do this with canning too; makes the task SEEM smaller even if it is not.) But yeah your seed rack last year was the BOMB. Aww, Judy, I love that! Before we had This Damned Cat, I would overwinter all kinds of things. Peppers are quite beautiful plants, too. In their native areas they’re perennial bushes. Well, MC, starting the seeds IS starting the spring process rolling along. There is good news there, you know? It’s really not so bad; I am simply owning up to the fact that I prefer my dirt out-of-doors. Hah, WS! In point of fact I oversow because onions can be really stingy in meeting one’s expectations. But I’ve rarely had none of them germinate: what a bummer. Lindsay, I’m just really saying it’s not all sunshine and smiles. Seeing the first seeds sprout, though, is quite fun! Little itty bitty tiny bits of greenery, and you think, wow, that was easy. Sylvie, I guess I am equally successful seeding stuff outdoors or indoors, with the exception of my garage-sprouting experiment that I mentioned, eaten by mice. I’ve been plugging away at seed-starting out in the greenhouses, too, just a row or so every day; keeps me sane. But yeah, cardoons and artichokes here need to be completely babied. Normally I bury the plants in dirt, then leaf mulch, then grass mulch, then straw, then I hold the whole deal down with burlap sacks and boards; mostly it’s successful but sometimes it isn’t so I start new seeds every year of both. (I have different plans for the bed they’re now in so I let them die this year.) The cardoon is Gobbo di Nizzia, from Baker Creek. ok – same cardoon here. I like them. They are beautiful and taste, although a lot of work to prepare – but not to grow. I think I would agree with you if I had to do it in the fall or, really, anytime else at all. But right around now I am just so darn *desperate* for anything resembling plants that even watching a leggy little seedlings in crusty pots is close enough. Well, lets just say ‘hardening off’ is something of a sink or swim proposition. They are no longer worth my time. Lol! I hate it too and an ever thankful when my husband does the tedious business of first getting the potting soil from the store and sets up my bench, and even fills the containers. If that business weren’t taken care of, I’m sure I’d never get started! Oh I LOVE starting seeds indoors. I get to watch their leaves unfold with each day. Yeah I could do more of it outside, but by the time I start seeing their leaves unfurl there, so have the slugs and they are toast. I so much prefer to give the plants a chance. Sylvie, the old farmer we bought this place from was Italian and he and his family grew cardoon. It was the big Christmas dish, apparently, blanched out from the center. He surprised the heck out of me by recognizing the plants: here I was, thinking I was so…couture with my veg choices but nah. Do you tie yours up? I do, usually in Aug., for a late-fall harvest of the blanched centers. It’s lovely in aioli, or simply a garlic broth with a big batch of hot bread. PlantingOaks, I know, hardening-off is just as big a pain as starting them. That greenhouse has been my salvation though because when most things get to be somewhat big I just move them out there into “transfer beds” to grow bigger until I move them outside. It worked really well last year esp. for those pesky tomatoes. But yeah this has been one LONG winter, eh? Goodness HDR you are quite lucky in your guy! I guess I just hate monkeying with the whole thing, but secretly I do love it when everything starts to poke above the surface of the soil. Daphne, sorry to learn about your slug woes. My problem here is the pesky voles, who LOVE pea shoots especially. We get slugs on our outdoor peppers so now they live in the greenhouse, unmolested. Hope you’ve started your stuff!